Sample wines from near and far. At the Syracuse Wine Festival you'll sample wines from New York's fantastic wine regions and beyond. If you like a particular wine you can purchase a bottle of it and take it home with you. There will be plenty of food to sample. After all, what goes better with wine than food, right? Grab a sample of wine and peruse the fantastic offerings of our partner vendors. Sample something you like? Purchase some and take it home. 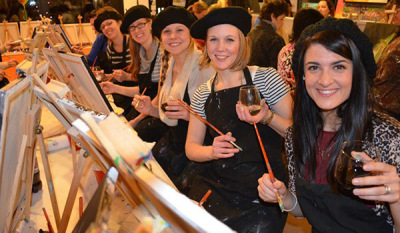 Whether you're joining a free painting class or playing Giant Jenga you'll find fun, unique things to do. You work hard for your money and we want you to have a blast, not just spend money. Tickets: Available at all Wegmans and on this website. There are several options to choose from on this website. Wegmans has the General Admission tickets only. All other ticket options must be purchased on this website by clicking the "Tickets" tab above. There is ample free parking at the Syracuse Regional Market. There is plenty of parking for buses(yes, we get buses) as well. If you're getting a bus group together contact us in advance for some special options we have for you. Please don't laugh, we've been asked this. Service animals are welcome. But house pets are not allowed. Can my Designated Driver attend with me? This is an "adult only" event. We understand that some people would like to bring children to this fun event. While we empathize with this thinking we've made the decision to keep this event for those over 21. We just don't believe that the atmosphere is appropriate for children. This event is for people 21 and over. Your designated driver can drop you off and pick you up at a designated site on the property. You also have the option of choosing to go to and from the event via Lyft or UBER. Designated Drivers over the age of 21 may enter the event and join all festivities other than wine sampling.